As we have seen the instruction about ISTQB in previous article. 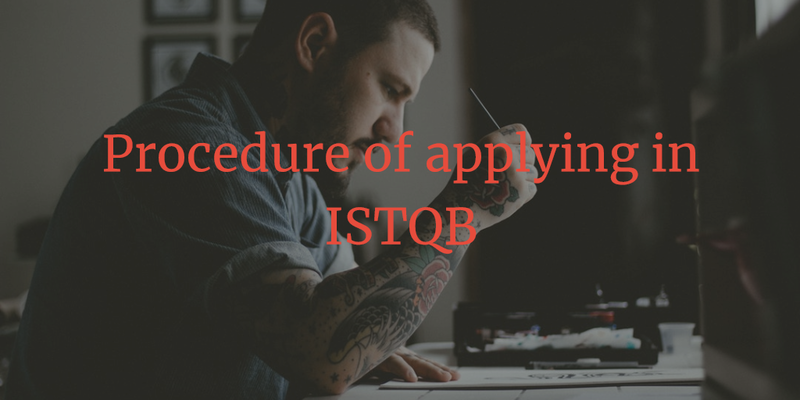 Now it’s time to verify the procedure that what is the procedure to apply in ISTQB examination and what will be required for applying. Plan ISTQB examination in well advance. As this examination have very high passing ratio, a candidate needs to be prepared before applying for the same. Check dates of ISTQB examination on site. As per the planning, enroll yourself on https://itb.formistry.com/. Here you need to provide your specific details. As soon as you will register, an informative mail will be sent on your entered email id in which you will get ‘Personal ID’ and other instructions. We have discussed that there are two type of examinations are available. You can appear individually or organization level. As per your selected option, Fees for the ISTQB will be conducted. Select public option if you will give exam individually Or else select corporate option if your organization will provide premises for 15 to 20 candidates. As per your selected criteria, Examination center will be provided. You can pay online till 11 days before of examination. You can do online transactions for fees or if you want to send a draft then send it on New Delhi office, Noida Office or Bangalore office. Address can be as below. (Before sending the draft, please check address on http://www.istqb.in/, it may possible that mentioned address can be changed due to any circumstances). One important thing is, do not forget to mention your contact details and registration number on draft. Now let’s get clear idea about the fees for ISTQB. This are the instruction about re-appearing in exam or what if you will be absent in exam. If you have lost your certificate and you want to get it back then ISTQB give you this chance with below fees. Once all the procedure for registration and payment have been completed then you will get your login information on your contact details. Make sure you will provide valid details. Otherwise you will not be able to connect with board. With this login details, you can login on person website and schedule your exam as per the convenient time. On the day of exam, you need to take photo identity card like adhdar card or driving license, PAN card, Passport, Election Card etc. Foundation level examination will be taken online. In foundation level exam, result will be on the spot displayed on screen after completing the examination. Thus, you will get idea immediately about pass and fail ratio. If you examination will be passed then you will get certificate by 8 to 10 weeks and your name will be displayed on ISTQB site within 3 months that you have officially certified foundation level exam of ISTQB. This all are the useful instruction which may be help you while appearing for ISTQB Foundation level examination. With this you can register yourself easily and get credentials for examination.